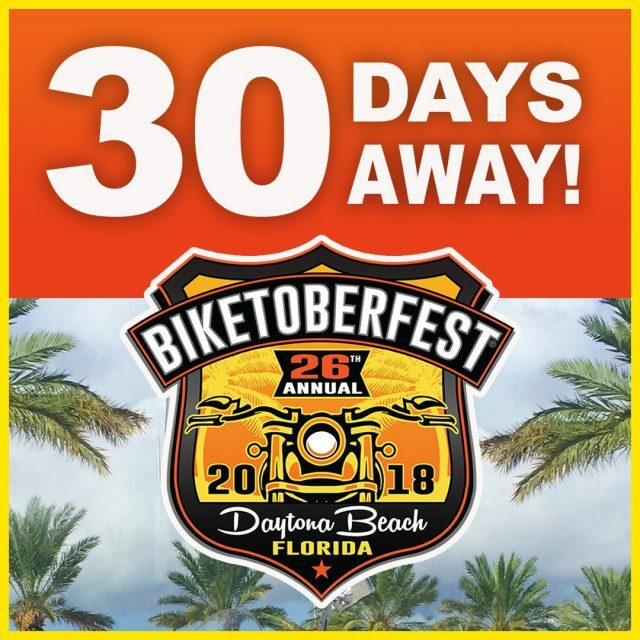 DAYTONA BEACH, Fla. (September 19, 2018) – The Daytona Beach 26th Annual Biketoberfest® Rally October 18-21, 2018 celebrates the adventure and spirit of today’s motorcycle enthusiast with biker events, scenic rides, racing, bike shows, concerts and the industry’s best power sports vendors. Daytona Beach Racing & Card Club Lucky Poker Chip, Free Concert and Vendors – Get first dibs on the collectible 2018 Biketoberfest® commemorative Lucky Poker Chip Thursday, Oct. 18 exclusively. (It will be available while supplies last at the Beach Street Welcome Tent Friday-Sunday, Oct. 19-21.) Enjoy a free concert with the Journey tribute band Chain Reaction, Thursday, Oct. 18, 6-8 p.m. Vendors, grand prize giveaway, giveaways, drink specials, 13 spectacular live action races and more. 960 South Williamson Boulevard, Daytona Beach. DaytonaGreyhound.com. Daytona International Speedway Marketplace, Free Demo Rides, Bike Shows and Motorcycle Races – Visit the area’s largest motorcycle marketplace with the nation’s top aftermarket product vendors. Enjoy free demo rides on Harley-Davidson, Indian, Suzuki and Yamaha motorcycles all weekend long. Don’t forget to stop by Harley-Davidson Thunder Alley for the Baddest Bagger Bike Show presented by Bagger Nation on Friday, Oct. 19, 10 a.m. – 4 p.m. or the annual Hot Leathers Fashion Show and Bikini Contest on Saturday, Oct. 20, 1 p.m. Also on Oct. 20, enter your bike into the GEICO Bike Show with Full Throttle Magazine which takes place next to Harley-Davidson Thunder Alley, 10 a.m. – 5 p.m. Motorcycle races: Friday, Oct. 19 to Sunday, Oct. 21, 8 a.m. – 5 p.m. Tickets are $10 on Friday, $25 on Saturday and $25 on Sunday. Daily admission also includes access to the UNOH Fanzone, garages, infield and free parking! Fans can also purchase a three-day general admission ticket (Oct. 19 – 21) for $50. Kids 12 and under are free all weekend. Friday kicks off with the Team Hammer Riding School and Saturday and Sunday features the Championship Cup Series (CCS) and the American Sportbike Racing Association competing on Daytona’s 3.51-mile road course. For tickets, call 1-800-PITSHOP or visit DaytonaInternationalSpeedway.com. 1801 West International Speedway Blvd., Daytona Beach. Bruce Rossmeyer’s Daytona Harley-Davidson / Bruce Rossmeyer’s Destination Daytona – Largest selection of Harley-Davidson motorcycles, apparel, parts and official licensed products, and largest selection of vendors outside the showroom plus shops, hotel, restaurant and bars. Live music and bike shows daily, including Harley-Davidson Demo Truck/Demo Rides Thursday, Oct. 18 – Saturday, Oct. 20, 9 a.m. – 4 p.m. Free “Kegs and Eggs” breakfast inside the showroom Thursday, Oct. 18 – Sunday, Oct. 21 at 9 a.m. while supplies last. Daily Brewtoberfest Beer Garden with fall beers on tap, food trucks and vendors in the Destination Daytona Pavilion with live music: Tru Adkins Friday, Oct. 19, 1 – 5 p.m., Nirvana tribute band, Nirvanna, 6 p.m.; and several Tru Adkins and Hellzapoppin Freak Show performances throughout Saturday, Oct. 20. followed by live music by Metropolis Rising. The Harley-Davidson Harley Owners Group (HOG) Pin Stop will also be inside the showroom. Showroom hours: Wednesday, Oct. 17 – Saturday, Oct. 20, 8 a.m. – 8 p.m., and Sunday, Oct. 21, 9 a.m. – 6 p.m. (386) 671-7100. 1637 North U.S. Hwy.1, Ormond Beach, BruceRossmeyer.com. Full Throttle Magazine Annual Boardwalk Bike Show – The 26th Annual Biketoberfest® Boardwalk Bike Show Friday, Oct. 19 from 8 a.m. – 5 p.m. is one of the best shows at the beach. Visit this location to see one-of-a-kind, gorgeous bikes in a beautiful beachfront setting. Registration from 8 a.m. – 2 p.m. Show begins at 11 a.m. $500 to best in show and a FIN GPS System, 20 categories, 59 trophies. Winners announced at 4 p.m. Enter the Boardwalk Bike Show via special access at the cross street of Main Street and Ocean Avenue. (727) 935-4875. FXRS, DYNAS and DONUTS at Donnie’s Donuts Saturday, October 20 with a ride out after. (386) 944-9750. 200 East Granada Boulevard, Ormond Beach. New Smyrna Speedway Sons of Speed Vintage Boardtrack Racing – Join thousands of motorcycle racing fans Friday, Oct. 19 from 3 – 5 p.m. for the sixth running of Sons of Speed, featuring vintage American racing motorcycles from 1910 to 1952. Cheer on 30 racing entrants, including local rider Shelly Rossmeyer-Pepe of Bruce Rossmeyer’s Daytona Harley-Davidson. 3939 State Road 44 (New Smyrna Speedway), New Smyrna Beach, Facebook.com/ChoppersInc. Ponce Inlet Lighthouse Biketoberfest® Events – Visit the lighthouse, tour the historical museums, learn about lighthouse life over 100 years ago and climb the largest lighthouse in Florida. An exhibit chronicling the history of Motorcycles on the Beach will be on display from noon – 2 p.m. during Biketoberfest®. All activities are included with general admission, no reservations required. General admission $6.95 adults, $1.95 children age 2-11. Open 10 a.m. – 6 p.m. Last admission sold at 5 p.m. (386) 761-1821. 4931 South Peninsula Drive, Ponce Inlet, PonceInlet.org. The commemorative Biketoberfest® poker chip will be available exclusively at Daytona Beach Racing & Card Club on Thursday, Oct. 18 and will be available at the Biketoberfest® Welcome Tent Friday, Oct. 19-Sunday, Oct. 21. The Welcome Tent will also have collectible pins for those who signed up for their Pin Pass in advance, along with free posters and pocket guides. Official merchandise can be purchased in advance here. This entry was posted in Event Reports and tagged Biketoberfest, Daytona, Events, News. Bookmark the permalink.